Born in Dar-es-Salaam, Tanzania, East Africa, on 13th December 1957 and subsequently educated in England, Kiranpal Singh's first music study was the tabla, which he pursued under the guidance of Shree Ripdhaman Singh of Punjab Gharana from 1970 to 1977. His potential as an artiste of the highest caliber was recognized by His Holiness Sri Sat Guru Jagjit Singh Ji Maharaj, spiritual guide and leader of the Namdhari Sikhs, on a visit to the UK, and His Holiness bountifully arranged for Kiranpal to be sent to Bombay to study Santoor in the traditional way under Pandit Shiv Kumar Sharma. He completed twelve years of study as an outstanding student, mastering the subtleties and intricacies of the instrument in such a commanding way, that he is now recognized as a leading disciple of Pandit Shiv Kumar Sharma, and in his own right as the principal Santoor player in Europe. Kiranpal has settled in England since 1987 and has gained respect and admiration for his various performances in the UK, Europe and beyond, in recitals, festivals and lecture demonstrations. Admired by both audiences and critics, his mastery of the advanced techniques of the instrument, combined with a creative flair and spontaneous imagination, has developed a recognizable individuality in his performances. This, in turn, has led him to be sought after as a co-leader of ground-breaking developmental and cross-cultural projects, whilst continuing to advance the presentation of Indian Classical music to ever widening audiences through his solo work. The santoor is an exquite 100 stringed unique to the Himalayan valley of Kashmir. The santoor has been a folk instrument there for centuries but in the last 40 years it has risen to new prominence. The many strings enable an immense variety of resonating sounds that fill the air like waves. 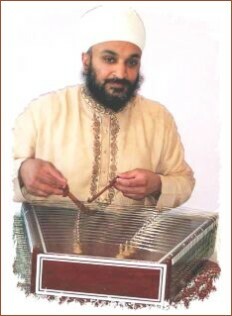 In a typical style of music known as 'Sufiana Mausiqi', the santoor has been played as an accompanying instrument with the vocalist and sometimes as a 'Solo' also. It was originally known as the 'Shata Tantri Veena', which is a Sanskrit word for a hundred stringed instrument. All stringed instruments in Ancient India were knowo as 'Veena'. Todays examples would be 'Rudra Veenac Vachitra Veenac. The name 'Santoor' was given by the Persians. Similar instruments are found all over tbe world like 'Santoor' in Iran, 'Yang Chin' in China, 'Cimbalom in Hungary and Rumania, 'Santoori in Greece, 'Hack Bret' in Germany and 'Hammered Dulcimer' in certain European countries and America. The Santoor is played with a pair of curved sticks made out of walnut wood. It produces variety of lively tonal effects reminiscent of the Piano or the Harp. With the innovations carried out on it by Pandit Shiv Kumar Sharma - the pioneer of the modern day santoor, it takes on a much wider range of expressiveness.